This post is labelled AD - Gifted PR because I was kindly sent the products to review from the pr company. If you follow me on Instagram, you may have seen my stories where I received a huge bag of products from Palmers. I was very excited when I opened the bag and found so many great products, which included hair care products, body care products, hand cream and a multi purpose swivel stick, as shown in the photograph above, and I couldn't wait to try them all. I knew it would take me a while to try everything out, and I like to try things quite a few times before I share my thoughts with you, unless of course it's a first impressions type post. I have been using all the products since receiving them and today I am going to share my thoughts on the hair care products with you, I did think about writing a post on all the products but decided it would be far too long as I like to give an in depth review, so I decided to split the products up. The haircare products I received are the Coconut Oil Conditioning Shampoo £4.19, the Coconut Oil Repairing Conditioner £4.19 and the Coconut Oil Leave In Conditioner £4.99. All three of the hair care products contain ethically and sustainably sourced coconut oil and Tahitian monoï oil and all three products are free from sulphates, parabens, phthalates, mineral oil, gluten or dyes. Palmers is a cruelty free company and does not conduct product tests on animals. 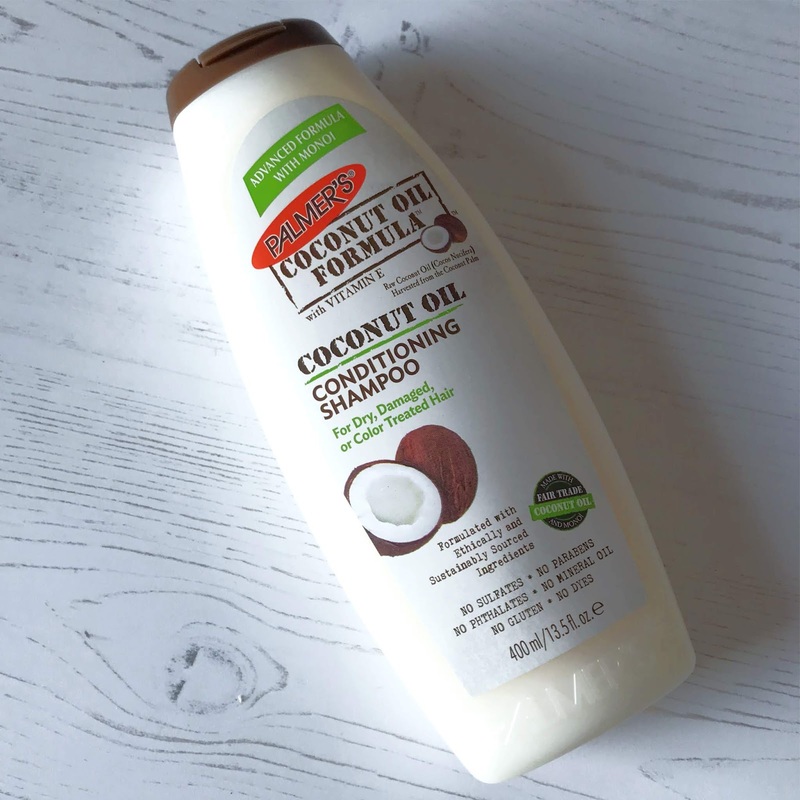 Palmer's Coconut Oil Formla Coconut Oil Conditioning Shampoo is a rich, creamy shampoo, free of sulfates and harsh detergents, that gently cleanses and removes buildup without stripping hair or interrupting its delicate moisture balance. I thought I'd give you a bit of a background on my hair type, but if you're a regular reader of my blog, you will be aware that I have very thin hair and my hair is also extremely oily, so oily that sometimes it can be washed in a morning and be looking oily by the evening, but if not it would definitely always oily the day after it has been washed. I also have my hair coloured using a tint, no bleach. Having blonde hair, I use a violet toned shampoo more often than not. After reading that the Palmers shampoo was suitable for dry, damaged and colour treated hair, I worried it wouldn't be suitable for my hair because my hair is so oily. The first time I had my hair washed with the shampoo, I didn't try any of the conditioning products because I wanted to try them all separately and together for the purpose my review. The shampoo is in a large 400ml bottle with a flip top lid and is easy to open. The shampoo smells incredible and has a lovely coconut scent, reminding me of summer and holidays. The shampoo lathered up well and rinsed out with ease, my hair is awful to brush through when it is wet, despite it being extremely thin, it resembles a birds nest and takes some brushing through. After having my hair washed with the Palmers shampoo, my hair didn't look so birds nest like and it did brush through a little easier than usual. Once brushed through, my hair was dried, no styling as such, just dried off the with hairdryer whilst being brushed through at the same time, I don't have a style, my hair is long and straight. My hair smelled beautiful after it had been dried and felt lovely and soft and looked healthy and shiny and my first impressions were excellent. 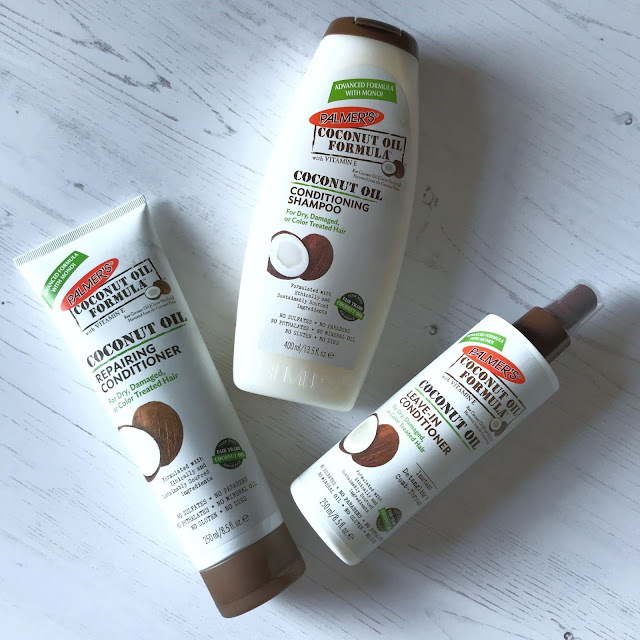 Palmer's Coconut Oil Formula Coconut Oil Repairing Conditioner is a rich, creamy conditioner that instantly detangles and coats strands for silkier, shinier and easier to manage hair. As with the shampoo, the conditioner smells lovely, it has the same scent as the shampoo. I don't use conditioner regularly because I find my hair gets very oily, very quickly, so I only use it once a month, and when I do use it, I have it applied only to the mid lengths and ends of my hair and never near my roots. The directions on the conditioner are to use after shampooing and to apply and leave to penetrate the hair for 3-5 minutes before rinsing, the first time I used the conditioner, I used it with the Palmers shampoo and it was left for around 3 minutes before rinsing. My hair was nice and easy to brush through once towel dried and when it had been dried with the hair dryer, it felt lovely and soft and silky and smelled beautiful and again, my first impressions were excellent. The conditioner has the same flip top lid as the shampoo and is easy to open and close. 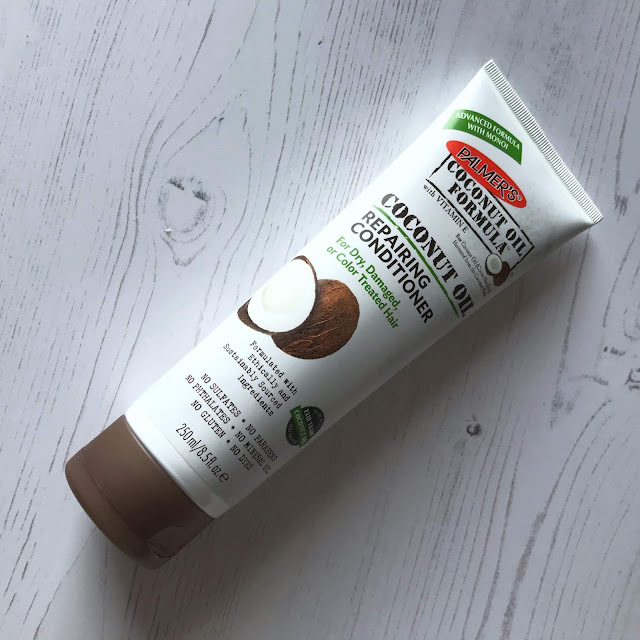 Palmer’s Coconut Oil Leave In Conditioner instantly detangles, putting an end to tugging and pulling. With a few sprays hair has instant slip and silkiness for easier comb-through and styling. Hair nourishing emollients fortify hair, control frizz, reduce split ends and give hair healthy-looking shine. The leave in conditioner is so easy to use and sprays an even mist onto the hair, I find some sprays just squirt out randomly which is annoying but this doesn't it sprays a nice even mist of the conditioner. I use around 4 sprays of this after my hair has been towel dried. My hair as I said resembles a birds nest when it has been washed and towel dried and it is very hard to brush through, this makes it so much easier and my hair smells incredible, and when it is wet and has been towel dried it brushes through with ease and my hair is left looking and feeling soft and sleek. I absolutely adore the Palmers Coconut Oil haircare range, all three products smell incredible and leave my hair looking lovely and shiny which is difficult with blonde hair, and feeling soft and silky and smelling amazing. 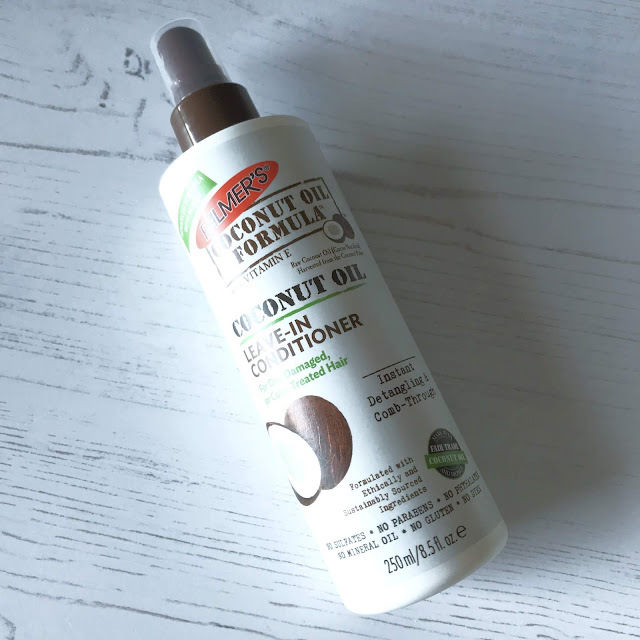 One of the best things I have found since using the products is that I noticed within the first couple of weeks of using the products was, that my hair doesn't get oily as quickly as it used to. To not have oily hair usually, I would have to have my hair washed every single day, sometimes it can be oily in the evening as it has been washed in a morning. At first I thought my hair might not be getting oily as fast because I'd been really poorly with a chest and kidney infection so hadn't had my hair washed for almost 2 weeks, which I know is absolutely gross, but I was just too poorly. I continued to use the shampoo and noticed that my hair can go days in between washing with just a small amount of dry shampoo and I can wear it down for that length of time too which is completely unheard of for me. I can literally get my hair washed on a Saturday, then not have to wash it until Wednesday and that NEVER happens. And if I didn't wash it on Wednesday, I could get away with dry shampoo and wearing my hair up until Saturday when it is washed again, meaning I can go a whole week without having my hair washed. This for me is completely unheard of, usually if my hair is washed on Saturday, it would look greasy at the crown on Sunday so would have to be dry shampooed and worn up, then washed on Monday. It's amazing that I can wear my hair down for days in a row, and not having to have my hair washed twice a week or more if needed is so much better for me body/health wise too. My favourite combination to use on my hair is the shampoo, followed by the leave in conditioner, it is a fantastic combination of products for my hair, my hair looks, smooth, sleek and shiny, smells amazing and looks great for days, around once a month I will use the repairing conditioner to give my hair a deeper condition. I have also used the leave in conditioner with my violet shampoo and it works brilliantly with that too and again I can go days without having my hair washed which is just brilliant for me. As with a lot of the products I review, my family also try the products for me so that I can give you another opinion on the products other than mine. My eldest daughter has been using the products too, she has her hair bleached and has done for a while and as a result her hair is very dry, she absolutely loves the products and has tried them all. After using them all and trying the shampoo with both the leave in conditioner and the repairing conditioner, she finds the shampoo and repairing conditioner are best for her hair and she said her hair looks and feels so much better when she uses them than with her regular hair products, she is very impressed and said she will continue to use the products. 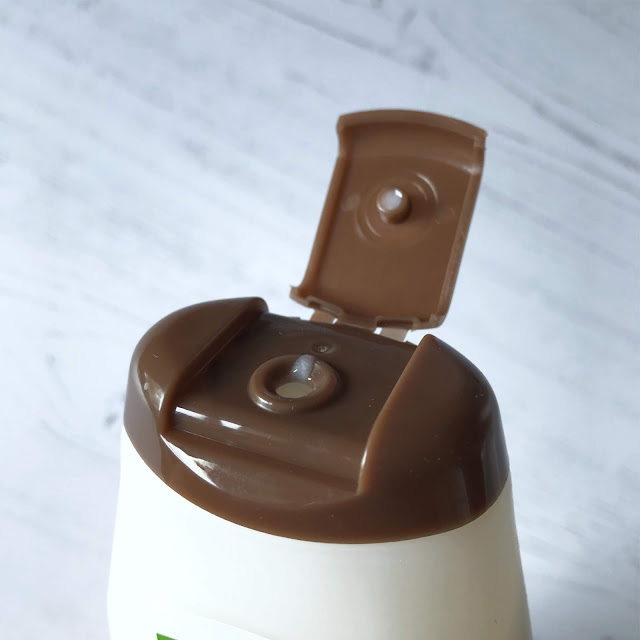 I love that the shampoo is 400ml, meaning it lasts really well, and you don't need to use lots of the product, the 400ml bottle lasted brilliantly and since reviewing the products for my blog, I have since purchased the shampoo myself because I didn't want to run out. The leave in conditioner and repairing conditioner both still have some product left which is brilliant and shows that a little goes a long way. I use around 4 sprays of the leave in conditioner and a small amount of the repairing conditioner is enough, meaning the products last really well, I will be purchasing both the conditioners once they are running low. All in all, I am extremely impressed with all 3 of the products, my hair looks and feels so much better and the fact that I no longer suffer with oily hair is nothing short of a miracle, I am blown away that I have my hair washed once a week and it doesn't look oily in between, I have suffered with oily hair for around 22 years, so as you can imagine I am VERY happy that I no longer have oily hair. If you would like to try the Palmers Coconut Oil hair products, you can find them online and in store at Superdrug and Boots, or if you prefer, you can find the shampoo here - £4.19 the leave in conditioner here - £4.99 and the repairing conditioner here -£4.19 from the Superdrug website where they currently have a buy one, get the second half price offer, so a great time to try! 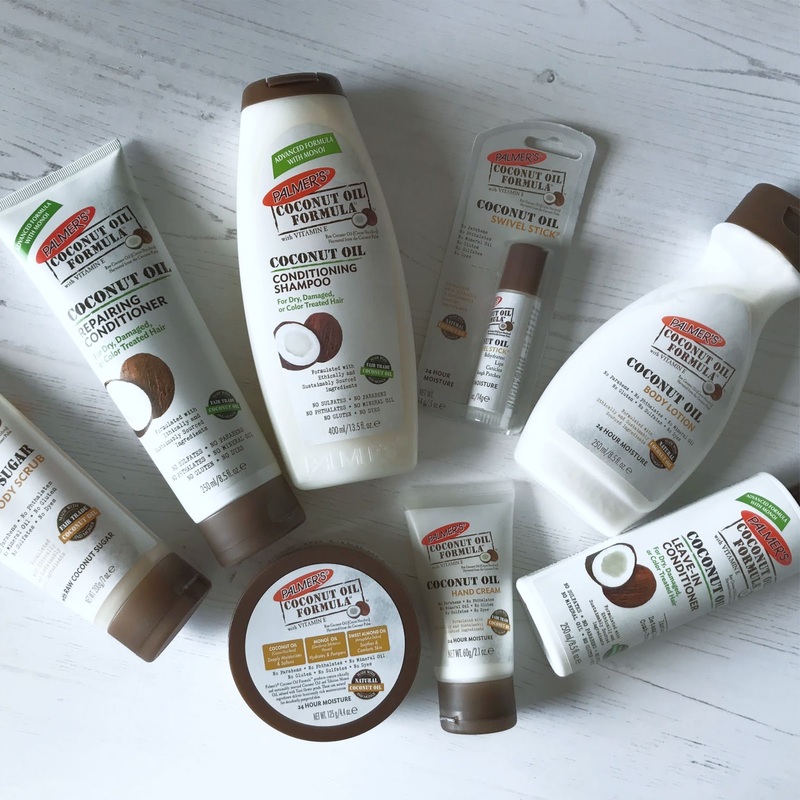 Have you tried the Palmers Coconut Oil hair care range? And don't forget to keep your eyes peeled for my in depth review of the Palmers Coconut Oil body care range and other products, coming soon to the blog. The links used in this post contain affiliate links, please see my disclaimer for more details.